Hi there! 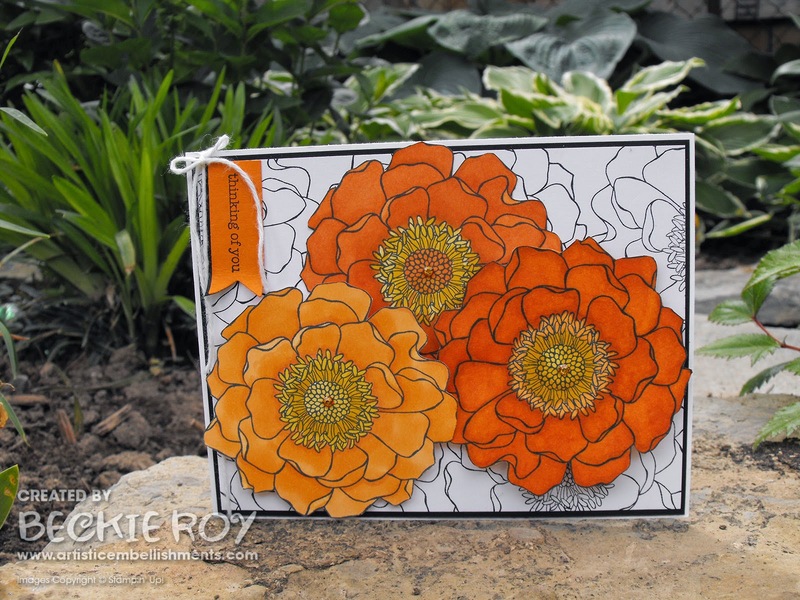 Today, my share is called Pumpkin Pie Blendabilities Blended Blooms! Well, try to say that 10 times fast... Blendabilities blended blooms, blendabilities blended blooms... well you know! I will admit that I was a skeptic when it came to the new Blendabilities markers. Stampin' Up! announced that they were going to be releasing them in the first half of 2014, I wasn't as excited as some other demonstrators as I've never been a fan of colouring. I've tried Copics and really didn't get all the hype. Well, even though I was skeptical - I ordered a few colours to give them a try and they proved me wrong...... I LOVE THEM! They are very smooth when colouring, the tip doesn't fray, the colours don't bleed or pick up dark colours with lighter markers. I still need a lot of practice and have ordered more colours to play with. I'm very excited for their upcoming release and am sure that you all will love them too! For my card today, I started with a piece of Whisper White. I stamped the 'Blended Bloom' stamp - since it's a wooden stamp I used my 'Stamp-a-ma-jig' so I wouldn't overlap my flowers. It made a nice Black + White background for my card. I coloured 3 flowers, one in a lighter shade, medium and darker. I did use all 3 colour markers from the Pumpkin Pie assortment, I just changed the marker that I started with. I like the lightest one the best - but hey, they're all orange so they are all fab! I fussy cut all of the flower out and attached them to my B+W layer from lightest to darkest. I finished with a piece of Whisper White Baker's twine and a banner with a thinking of you sentiment from 'Teeny Tiny Wishes'.